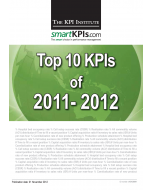 The Top 25 Accounting KPIs – 2016 Extended Edition report compiles the most popular 25 KPIs used by global Accounting divisions throughout 2009 and 2015. One of the most important benefits that this report brings is an international perspective on the most popular Accounting KPIs. They provide quantifiable measurement of the main components that lead to a successful implementation of financial strategies. The Top 25 Accounting KPIs – 2016 Extended Edition provides a complete hands-on experience in working with KPIs as it contains not only 2 pages of detailed documentation for each KPI, but also interesting articles on best practices in terms of KPI selection and documentation. 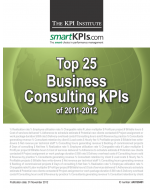 Top 25 Accounting KPIs list not only itemizes the Top 25 Accounting KPIs on smartKPIs.com, as per the popularity of the selected indicators on the online community platform, but also provides comprehensive insight into the accounting functional area overall. A new and improved collection of the most popular Accounting KPIs on smartKPIs.com, the Top 25 Accounting KPIs-2016 Extended Edition introduces a distinctive, unprecedented design of the KPI Documentation Form. 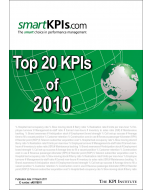 Specifically developed to take the reader one step closer to an efficient KPI monitoring and reporting process, the Top 25 Accounting KPIs -2016 Extended Edition makes for a valuable addition to any KPI Library used by professionals in the accounting field.